On our daily tasks, we pass a lot of information to others. When it comes to official communication especially work-related, it is important to ensure that the information passed is accurate. However, things get out of hand and for one reason or the other we provide the wrong information. In case of such an occurrence, an apology letter for giving wrong information is of great importance to ensure that the receiving end becomes aware of the same. It is always best to write this letter immediately you notice there is a problem. Here are some steps to consider when writing this apology letter. If you are the one that noticed about the mistake, apologize immediately and let the recipient know that you understand the inconveniences caused and you are sorry. In a case where it is the recipient that noticed the mistake, thank them for bringing it to your attention and end with a positive statement. Here are some of the sentences you can use. An apology letter for sending a wrong attachment aims at alerting the recipient of the attachment of the error made. With this letter, you can now attach the right file. I wish to express my apologies for sending a wrong attachment on the mail sent on [00/00/0000] under the subject [SUBJECT]. I understand this might have brought up inconveniences to you and others relying on the attachment. I will not give excuses for what happened as I understand it is my obligation to ensure that the correct document is attached. Attached to this mail is the correct document. 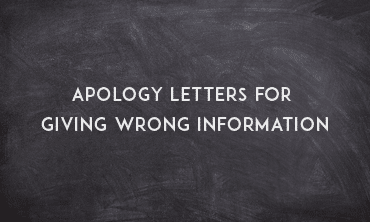 An apology letter for giving wrong information is written to apologize for giving that information. At the same time, it is in this letter that you ought to set the records straight. I understand this is wrong and will not give excuses for my actions. I will endeavor to provide the correct and accurate information to gain back your trust. An apology email to client for sending wrong information is sent when inaccurate information is sent to the client. It is ideal to include the correct information in this email. I wish to offer my apologies for sending the wrong information on the email dated [00/00/0000] under the subject [SUBJECT]. I understand the wrong information might have brought inconveniences on your end. The correct information ought to have been [INFORMATION]. I am sorry that I brought up the inconveniences and I will ensure to be cautious in future to avoid such an incident. I am sorry there was a mistake on our last transactions. The quotation I gave was not for the products you had requested. I apologize for this mistake. I will send the right quotation via your Email address before the end of the day. I promise this will not happen again in our future business engagement. Kindly consider my apologies. I am writing on behalf of our company to express our sincere apologies for the error that occurred in your bill. It is unfortunate that we only realized when you came by the office to let us know. Kindly accept our apologies. The error occurred due to a typing error that led to adding up a zero and getting a figure that was way beyond what you were supposed to pay. We have rectified the bill and have sent the right one to your Email. We promise that this mistake will not happen again in future. We look forward to serving you better to keep the business relationship between us strong. This is in reference to the last payment made by us to your company. I am sorry that this was not the correct figure that was supposed to be paid. The payment was made for invoice 058. I have found that this was the wrong payment made to you. The check no 0014 that we sent you on 14/4/2016, was in the amount of $ 100,000 which was short of the actual due amount of $ 130,000. I am enclosing a new check no 0029 with this letter in amount of $ 30,000, for difference amount. I am sorry that this mistake occurred. Please accept my sincere apologies. This is to kindly express my sincere apology for sending an email that was not meant for you. I am so sorry that this had to happen. I was in the process of responding to emails when my computer broke down and failed to function well. The mails were then sent to wrong recipient in the process of fixing the computer and there was no way I could stop this. I am sorry for the inconvenience that this email may have caused you. I hope you forgive me. Wrong information can bring dare consequences to the provider or even the recipient of the letter. This being the case, as a sender you should sound sincere and pledge to be more careful in future. It is also important to ensure that this is done soonest possible.